I thought Bonaire was a quiet diver’s paradise with little more to offer than a few diving properties and some turquoise waters. 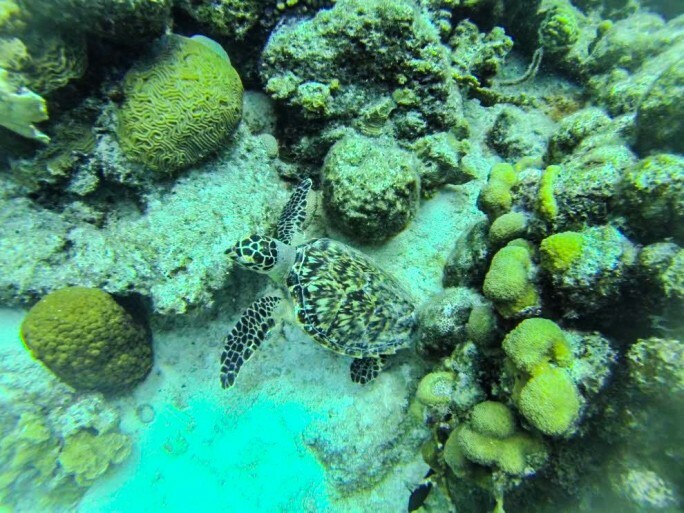 Scarcely enough for passionate divers, a Bonaire vacation didn’t grab my attention. Visiting most of the islands in the Caribbean, and recently both Aruba and Curacao, two other Dutch islands, it seemed time to at least look at Bonaire. What I found was both a small island Caribbean feel and countless adventures to soothe even my extreme addiction. 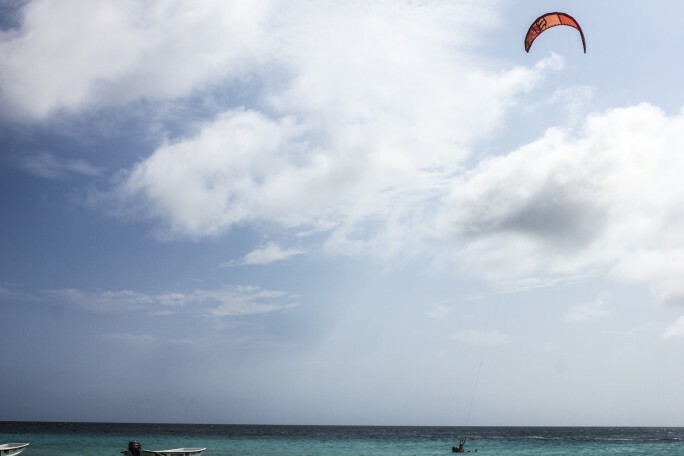 Whether you’re looking for a calm, relaxing day sailing the ocean and snorkeling those crystal blue waters or you’re searching for a physically and emotionally demanding adventure like kiteboarding, you can find it all on Bonaire. How adventurous would your Bonaire vacation be? Within one week of my Bonaire vacation, I worked my way through 5 adventures in Bonaire including sailing Bonaire, snorkeling, cave snorkeling, windsurfing, and kiteboarding. 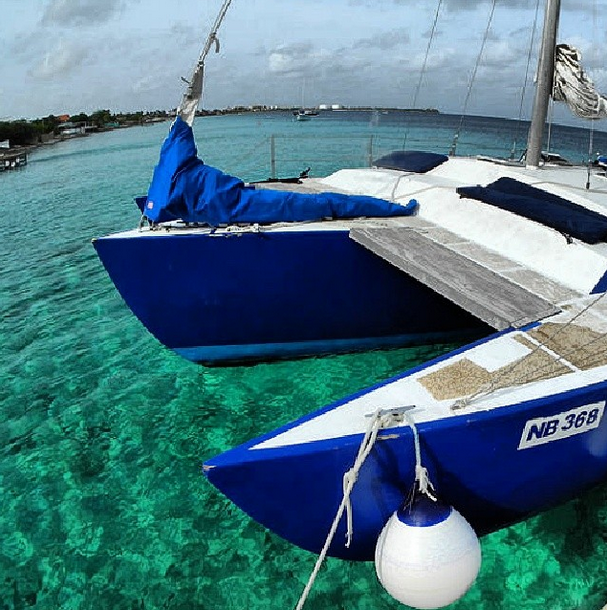 Aboard Woodwind’s 37-foot trimaran, I experienced my first adventure on my Bonaire vacation. I sailed away to some of Bonaire’s most exotic reefs, where I explored, swam, snorkeled, and followed a bale of turtles. The crew’s knowledge of underwater marine life and exceptionally friendly nature made the experience an adventure both in and out of the water. While this was the tamest adventure on the island, it was one of my favorite days. We stopped at three unique snorkel spots and each one was diversely different with the last being my favorite. A bale of turtles calmly passed by as if I was part of the group and I was in an underwater heaven. Normally, I feel anxious in the water but their gentle movements and smiling faces left me with a sense of ease that is typical for Bonaire guests. Many of Bonaire’s beauties are obvious from the first moment you step on the island but one of the island’s most interesting features remains largely hidden from view. My second adventure in Bonaire was cave snorkeling with Flow Bonaire. 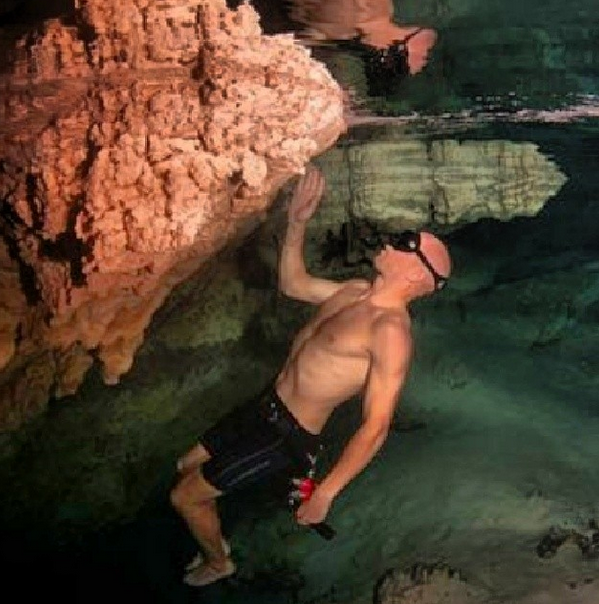 I was greeted by impressive stalactites and stalagmites and glass-like pools of clear water. I had the opportunity to free dive and continue deeper into the cave system. It was nerve-racking at first. I worried that I wouldn’t be able to hold my breath long enough to make it to the other side but my curiosity was too strong to pass. Rudy, my guide, made a huge difference as well. He could go under and back without coming up for air. I knew that if I struggled, he’d come and get me. My anxiousness made the experience even better. Arriving on the other side gave me a feeling of accomplishment and the beauty was heightened by my increased heart rate. It was a bucketlist worthy experience that I didn’t know was possible for a non-diver like myself. While not a new adventure, the next one is my favorite and Bonaire has proven to be the ideal place to improve my skills. 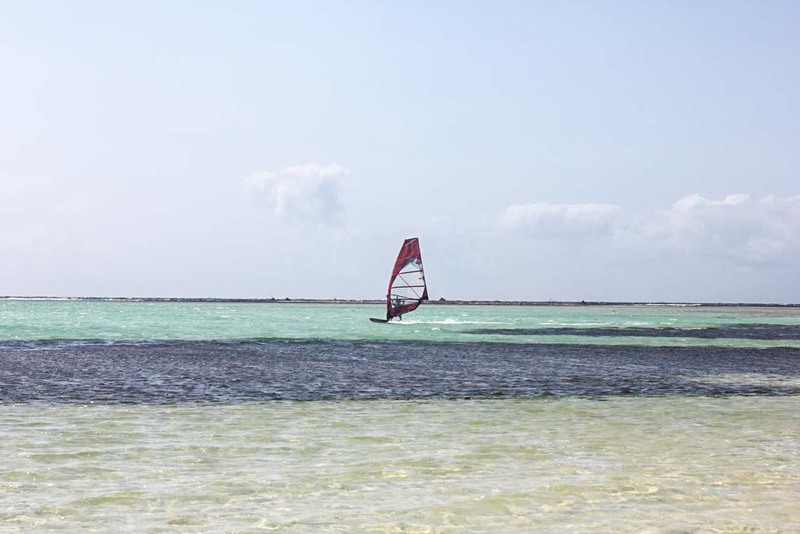 I’ve taken windsurfing lessons in more than a handful of Caribbean islands and I always enjoyed the process. At most destinations, I believe that I could have been much better if I wasn’t so worried about being swept away to sea. Bonaire, and Bonaire Windsurfing Place, completely eliminated that stress. Located on the windward side of the island known as Sorobon, at Lac Bay, the water is shallow and warm, with steady tradewinds, and a beautiful beach. It provided the perfect conditions for catching some wind, but in a sheltered and safe area. For four hours, I sailed, turned, learned to maneuver, fell, and got back up again. I was never much more than waist deep and the water was always crystal clear. It was the most fun I’d had windsurfing and I learned more in those four hours than all of my other lessons combined. I left feeling tired but proud of my accomplishments. If I seem confident about my adventures in Bonaire, that all changed during my last, and most intense, experience while kiteboarding. We practiced with a trainer kite for an hour and then headed out to the ocean for a “big girl” run at it. I was attached to the instructor from behind and we made our way out into the water. He controlled the kite in the beginning to explain a few more details then it was my turn. We were still attached but I was in control without the threat of too much power on my own. I moved the kite from side to side and tried following the instructions. “Move the kite back and forth from 1 to 2 o’clock”. Sounds simple enough right? Not so much when you’re being drug through the water, holding a kite, thinking about techniques, and worrying about what’s in the water below. It came together, though, when I stopped stressing about all the factors and just focused on the kite. It was uplifting and encouraging. Even though I still had very little skill and I barely managed to move with the board attached, I felt more a sense of “wow” than I did all week. I was learning something new. I was getting it. The light came on. It was that “aha” moment that I looked for daily as a teacher. The adventure that I had the lowest expectations turned out to be my greatest accomplishment. I don’t know how to relax. A “relaxing” Bonaire vacation in my eyes includes as much adventure as humanly possible. The most amazing thing about Bonaire is that regardless of how you like to relax, you can find endless possibilities around every corner. Would you be willing to try an adventure that is completely outside of your comfort zone? Give it a go! You’ll be surprised with how capable you are.